A very highly anticipated Premier League matchup today, with Man U vs Arsenal kicking off in a matter of minutes at Old Trafford. Certainly it’s a significant match for this edition of the Premier League race, with Arsenal one point ahead of Manchester United at the top of the table (Man U do have a game in hand, and in fact are undefeated so far in the Premier League–but they definitely haven’t looked invincible). Beyond just the current standings, however, Man U and Arsenal have developed quite the heated rivalry over the past couple decades–not as historically/geographically rooted as some other English football rivalries perhaps, but given the clashing personalities of their famous managers and especially the strength of their sides, it’s become one of the mostly highly anticipated fixtures in the Premier League. Two clashes in particular stand out–as evidenced by the fact that they have their own Wikipedia entries: The Battle of Old Trafford (a 0-0 draw in Sept 2003) and The Battle of the Buffet (a 2-0 victory for Man U the following season, in Oct 2004). 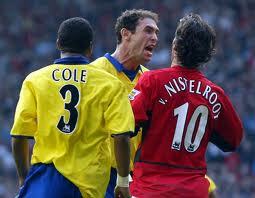 The events of the Battle of Old Trafford feature heavily in the videos below: van Nistelrooy drawing a second yellow for Patrick Vieira, with Vieira subsequently going buckwild after the Dutchman; and then van Nistelrooy missing a PK in extra time to preserve the draw–with Arsenal defender then getting in van Nistelrooy’s face. It was a miss that became especially significant in Premier League history, as that was the year of the Invincibles–the only side to go undefeated thru an entire season.